Belgium Beats Ireland with Counterattacking Mastery! After a complicated opener in the first game against Italy and a moderate first half against Ireland Belgium ultimately wins clearly with 3:0 as Lukaku scores twice. Same Old Problems – Just A Different Day! As in the first group match against the (much stronger) Italians the favorites Belgium presented itself bad in attacks out of clear possession. Again, they presented with no real solution to a compact defending opponent. 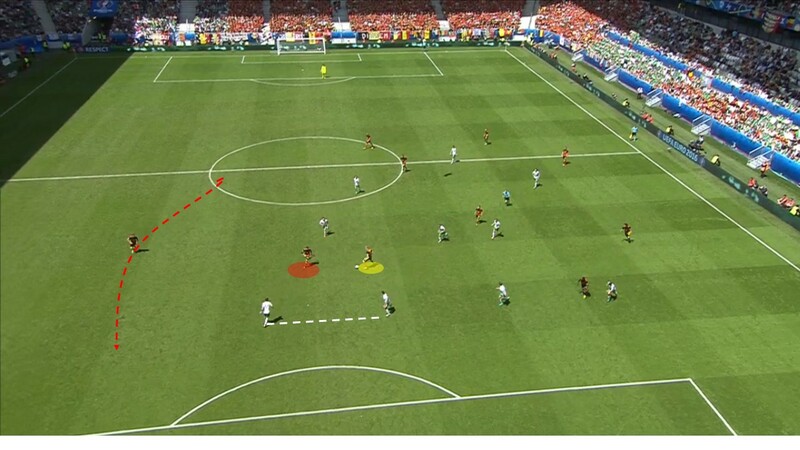 Example 1: Belgium has the ball in the center and plays from one side to another. Throughout the sequence, Lukaku does not open up a single time. 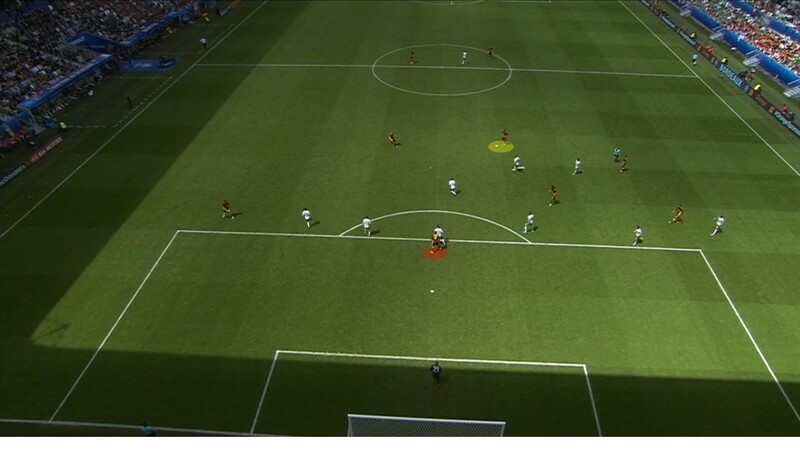 Here in this still image he hides even downright behind the Irish central defender. This makes it extremely difficult to find areas in the low-lying defense. Lf Lukaku regularly opens up, he can be played at, can block a defender for a passing lane to himself or at least be dangerous in order to be respected by the defending team so that they have to close that passing lanes (which opens up other spaces). Belgium wants (and needs) to Get in Transition! What did not work in possession should fold in transition. 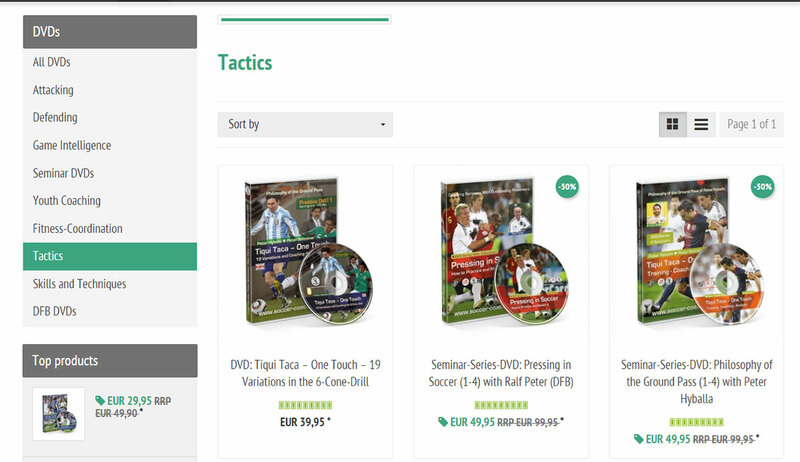 In counterattack situations especially the individual skills of De Bruyne are dangerous. However, not without the help of the defense of Ireland. Example 1: A corner the ball is cleared and flies toward Lukaku. Already at that moment Ireland has serious problems. Lukaku’s opponent is too far away to prevent a header into the free space. The center of the Irish did not mark De Bruyne. What follows is a presentation of quality by the Belgian superstar and the 3: 0 by Lukaku. 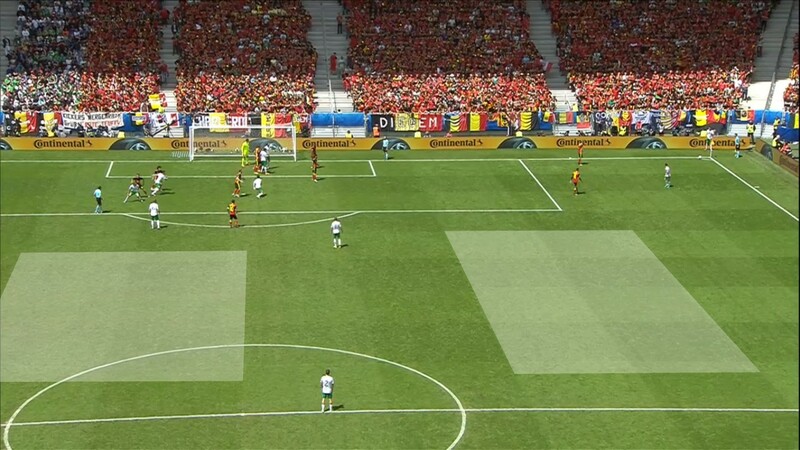 The Belgium consistently trying to achieve goals through their transition game, displays itself in their fundamental organization at opposing corners. In corners of the Irish all ten outfield players position themselves in the penalty area – De Bruyne on edge of the box. In the event that the goalkeeper catches the ball De Bruyne and Hazard find open spaces that can be used. 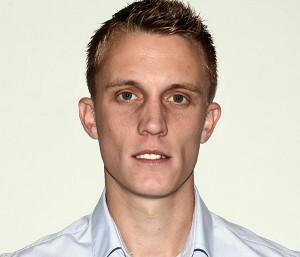 The rapid pace of Belgium’s players in make it almost impossible to defend such situations well. And despite this focus on counterattacks Belgium, except De Bruyne and Hazard, miss, to use openings in the opposing defense consistently. Example 1: The ball is by a player in the center (yellow). 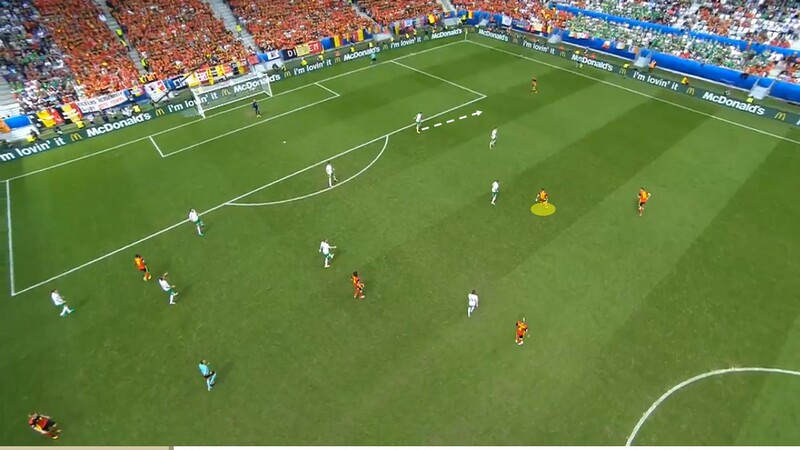 Instead of running towards the gaps in the opposing defense and thus perform an action that requires a response of the Irish, two Belgians run together on the same level and hope for a quick pass. 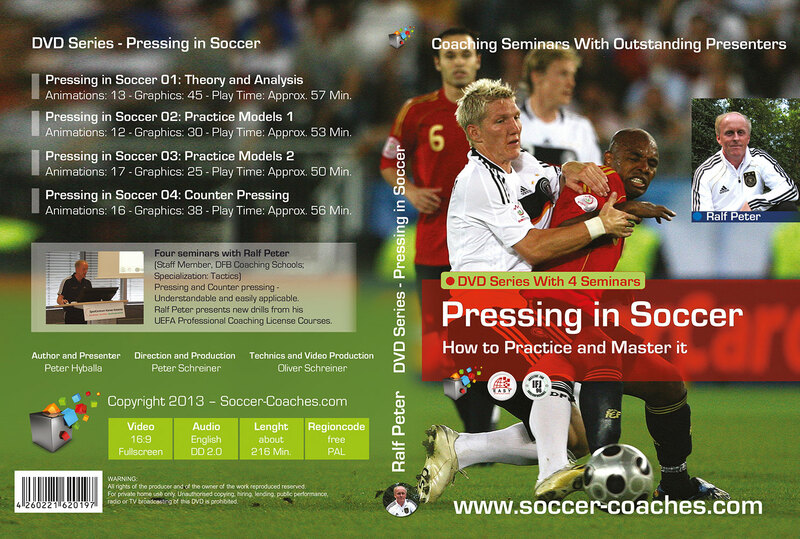 Example 2: De Bruyne in the center receive the ball and is not under pressure. Instead of running in the gap in the defense Dembele (red) decides to just stay (!) next to De Bruyne. The right defender Meunier runs far too wide. Afterwards, he is passed to by De Bruyne, but is too far out for a dangerous shot on goal. That Belgium ultimately still managed a goal against a set opponent organization was mainly because of the lack of intensity and wrong decision making by the Irish players. Example: Hazard has the ball. 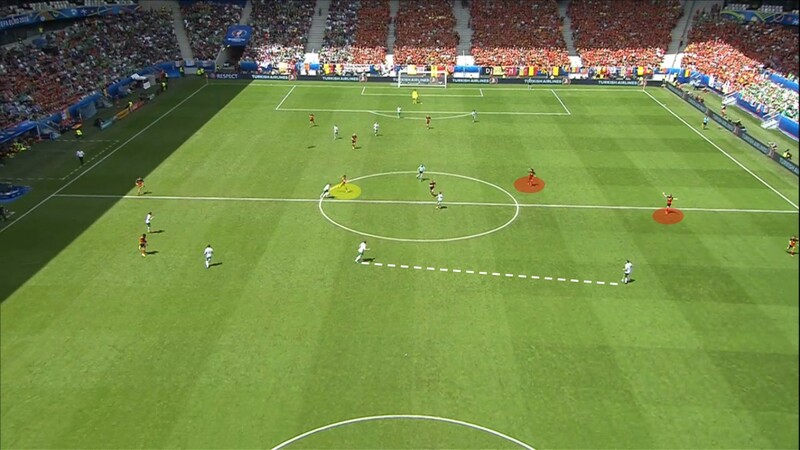 Belgium has not occupied a vertical passing option. There is no reason for Ward (Irish left-back) not to defend wider. This safety distance he holds a long. 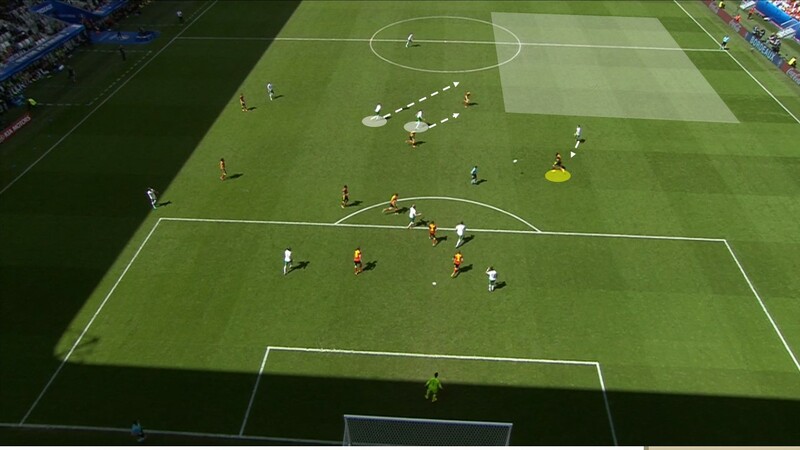 The ball is put back to the penalty area and also no pressure is put on the player in possession. Axel Witsel scored after the cross and decides the game. Conclusion: Ultimately, gave Ireland Belgium the spaces they needed. 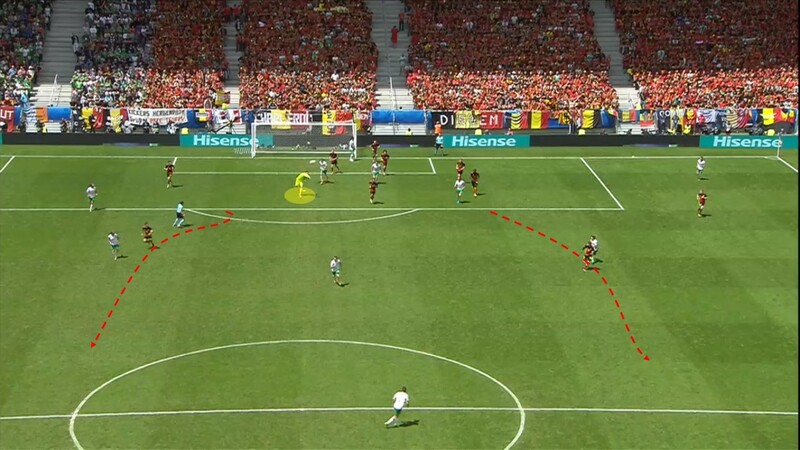 So Belgium was able to show its brutal counterattack quality. For the remainder of the tournament, the question is whether Belgium can score against teams with better insurance defense (for example Germany).